Portable hot tubs are the inflatable cousins of regular hard shelled hot tubs with many of the same amazing benefits while being cheaper, portable and ideal for small spaces. We are going to go over every feature of portable and inflatable hot tubs including accessories also found on regular hot tubs like massaging jets, soothing LED lights and therapeutic salt water technology. The idea of owning a hot tub might seem out of reach or a luxury that only the rich can afford. You may also think that you don't have enough space to set up a relaxing hot tub either in your yard or inside your home. Another reason you might have held off purchasing a new hot tub is that you don't want to invest money if you are going to be moving or you are renting where you live. Whatever your reason was for not purchasing a hot tub in the past we have good news. The advancements in the quality and the low price of the best portable hot tubs has made them extremely affordable, very durable and you can take them with you just about anywhere with a regular plug-in. Relax with your significant other in a small 2 man hot tub or entertain guests in a large hot tub that can comfortably seat 4--6 adults, just about anywhere; inside your house or apartment, in your back yard and even camping. There are 3 main reasons portable hot tubs are appealing when compared to regular hot tubs. In addition to portability, price and size you really get a ton of benefits for a very affordable price. It's a rare occurrence for an inflatable hot tub owner to be unhappy with their purchase or the enjoyment and satisfaction they bring. Portability. As the name suggests, a portable hot tub is designed to be portable so it can be easily transported and set up with many boasting plug and play convenience. Price. Portable hot tub prices are very reasonable especially when you consider everything you get with a basic model starting around $300, and they don't require professional installation. Size. The small and compact size of most tubs means they can be set up and enjoyed just about anywhere as long as there is a regular electrical outlet nearby and the weight can be supported. When comparing a portable hot tub vs regular hot tub there are a few big differences worth examining especially if you plan on using it outside in freezing winter temperatures. We'll take a look at the main differences between portable hot tubs and regular hot tubs followed by specifications for each type of tub so you can see how they compare. Portable hot tubs are usually self-contained, known for their ease of installation and plug and play capabilities. Plug and play (PnP) is a term used to describe a product that works out of the box by simply plugging it in without adjustment or alteration by the user. A plug and play hot tub operates on a regular 110 or 120 volt household outlet that you would plug your fan or coffee maker into. A regular hard-wired hot tub requires installation by an electrician because it requires a 240 volt electrical connection which doesn't come standard in most homes. This complex installation usually means that regular hot tubs are considered permanent, in addition to a higher up front cost for installation. A portable hot tub will likely be equipped with a small pump and heater that's operated by a single motor. The motor will likely draw between 500-1500 Watts per hour which is similar to a dishwasher or refrigerator. It should be noted that with the smaller motor, some models of inflatable tubs have trouble operating a heater and air jets simultaneously. A regular hard-shell hot tub is equipped with a much larger motor, or two motors, that are capable of operating the pump, jets, lights and other features simultaneously. The larger motor draws between 4000-6000 Watts per hour which is similar to a large central air conditioner. The time it takes to heat and circulate the hot tub water with a larger motor will be reduced, which will lower costs. Portable hot tub running costs will range between $10-$25 per month in the summer and can increase substantially to $30-$80 per month if you operate your portable hot tub during the winter. Your monthly electrical usage will be lower if you use the hot tub less, use a properly fitted hot tub cover and if the air temperature rises. The temperature you keep your hot tub water at will play a part in electrical consumption. We recommend keeping it around 90℉ (32℃) when it's not being used and even lower (or emptying it) if you won't be using the hot tub for an extended period of time. It should only take a few hours to get the tub up to 100℉ (38℃) when you decide to have a soak. A regular hot tub will cost slightly more on average to operate compared to a portable hot tub. That is assuming that the average hard shell hot tub is larger, has a higher water volume and larger motor(s) operating the features. An insulated hard-shelled hot tub specifically manufactured for cold Canadian winters will retain heat energy and reduce heating costs in the winter. All portable hot tubs come with a water heater that heats the water at a rate of about 2℉ (1℃) per hour with all things being equal. This means that you can raise the temperature of normal tap water to 100℉ (38℃) in about 18-20 hours under normal conditions. This rate will be affected by variables like; water volume, air temperature and wind. Water temperature is controlled through a digital, LCD or touch screen control panel on most units. A typical shelled hot tub will heat water at a rate of 7℉ (4℃) per hour under normal conditions. It will heat tap water to 100℉ (38℃) in about 6-8 hours not accounting for external factors. The maximum safe (and legal) operating temperature and the limit for hot tubs is 104℉ (40℃). The specifications vary significantly when comparing portable hot tubs to regular hot tubs and are definitely worth taking a look at. 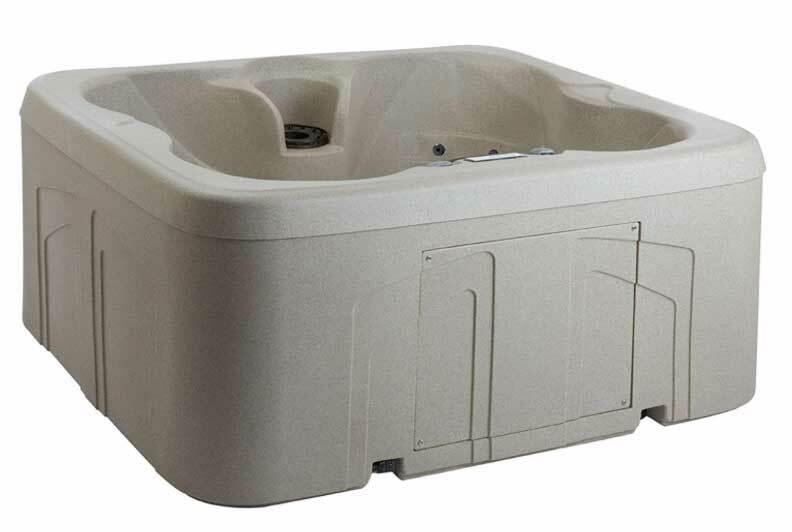 The biggest difference is base model price but you might be surprised to learn that portable tubs generally have more jets as well as some pretty cool hot tub accessories that are either included or purchased separately like lights, seats and cup holders. Let's take a quick look at portable hot tub pros and cons. At this point you should have a pretty good idea if an inflatable or blow up hot tub is right for you but you may still be on the fence. Another reason we really like cheap inflatable hot tubs is they are a great way way to discover if a permanent and expensive hot tub will fit your lifestyle, if you have time to use it or if it will just be a headache. It's pretty amazing that a product so affordable can actually come with as many accessories as portable hot tubs do. You really have a ton of options that will only add to your enjoyment while soaking and relieving life's stresses. It could be something as simple as a head rest for added comfort or a salt water system for the added therapeutic benefits. Seats. 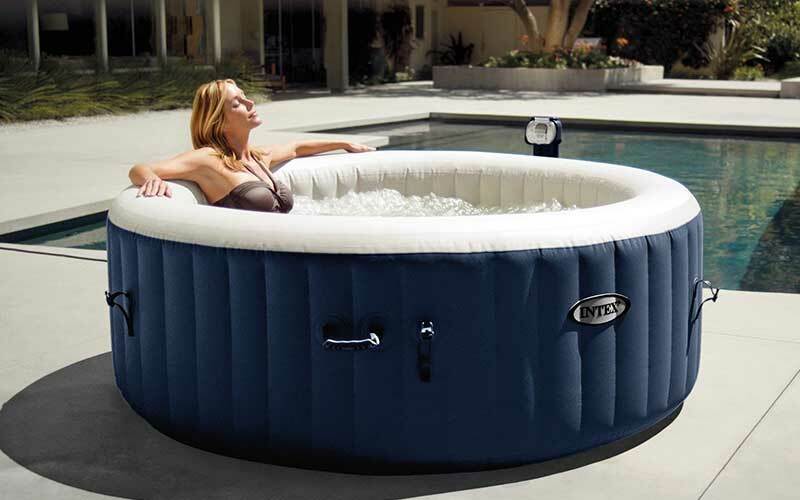 A hot tub seat will add to your relaxation by providing a comfortable place to sit in your inflatable hot tub. Make sure the seat is compatible with your tub by following the link in the product description. Head Rests. A head rest filled with air to fit your personal firmness preference. Cup Holders. A hot tub cup holder can come in very handy for keeping refreshing beverages nearby and securely attached to the wall. Salt Water Systems. A salt water system for hot tubs can be added to any portable hot tub to enjoy the benefits of salts or dead sea minerals. Water Softeners. If you live in an area that has hard water, a softener can make a world of difference when it comes to how your skin feels after a soak. Chemical Dispensers. If you plan on using your portable hot tub for months at a time and keeping it chemically balanced, a floating dispenser for chlorine can help ease your maintenance routine. Lights. Submersible hot tub LED lights can sooth or entertain depending on the mood you're trying to create, for an affordable price. In addition to portable hot tub accessories that can be purchased separately there are items that come standard with some models of inflatable hot tubs. If your hot tub doesn't come with any of the following items, they should be available online from Amazon. Cover. A quality cover will create a thermal barrier between your water and the outside air in addition to keeping your hot tub clean. Look for a locking safety cover to ensure that no one uses your hot tub without your supervision. Carry Bag or Tote. A bag to transport and store your inflatable hot tub is really handy and including with most popular brands of inflatable hot tubs like Intex and Coleman. Ground Mat. A mat for under your hot tub is important to prevent punctures especially if you're going to be using it outdoors on gravel or other potentially destructive surfaces. Maintenance and chemistry balancing is required to keep your hot tub sanitary and safe to use. It's similar to maintaining a hard shell hot tub in every way except you will require less chemicals due to the smaller volume of water. You can expect maintenance of your hot tub to cost about $200-$300 a year for basic balancing chemicals, filters, and a cleaner. You will require chlorine sanitizer that can be slowly dissolved in a chlorine dispenser unless you are using a salt water hot tub system. In addition, you should have on hand chemicals that can both raise or lower alkalinity and pH. As you learn how to balance your hot tub it will get easier to carry out regular hot tub maintenance. A hot tub test kit is also required if you plan on maintaining your hot tub yourself so you can test chemical levels regularly. We recommend purchasing a skimmer net, sponge and hot tub cleaner to include in your regular daily or weekly maintenance. You should never leave your inflatable hot tub for more than a couple days without testing it or making sure the system is still running smoothly. A shut down or auto off feature is common with some units and could lead to damage or unsafe water if the system shuts off, especially in cold temperatures. The best portable hot tubs on the market today are built to last and even be used year round in suitable weather conditions. If you are looking for a cheap portable hot tub you won't be disappointed with what you can find, especially when some units come with added features like; touch temperature controls, lighting and even water softeners. The Intex Pure Spa 6-Person Inflatable Portable Heated Bubble Hot Tub is our favourite and top rated inflatable hot tub on the market today. It has everything you want in a cheap portable hot tub while being durable, easy to set up and operate while being loaded with extra features. It can be set up in as little as 20 minutes and can be easily deflated for storage over winter or for transporting. This unit comes with 2 extra filter cartridges and filters can be purchased separately as needed. It also comes with a floating chlorine dispenser, thermal ground cloth, inflation hose, carry bag, 2 head rests and a 1 year manufacturers warranty. 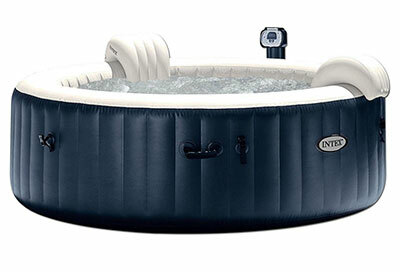 You will be enjoying 170 high powered bubble jets for a relaxing massage in no time in this top rated inflatable hot tub from Intex. 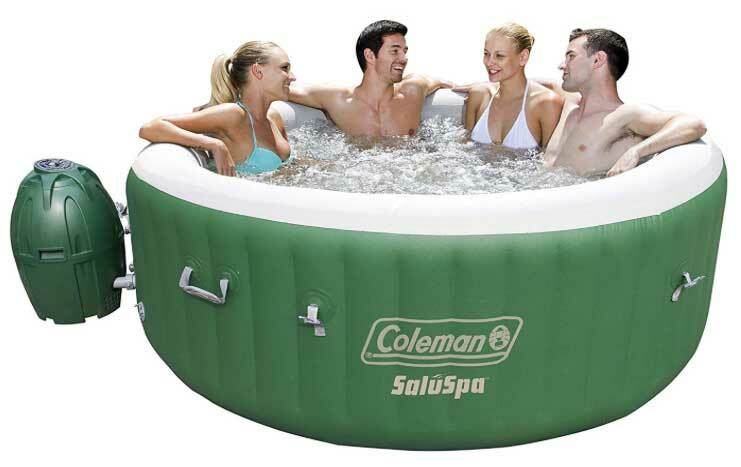 The Coleman SaluSpa Inflatable Hot Tub is the cheapest portable hot tub on our list. It makes the top rated list because of its track record for being durable, easy to operate and the automatic controller settings on the digital control panel. It's as easy as setting the temperature and enjoying the spa experience. It requires no tools for set up and inflates using the included spa pump in minutes. Quality construction is a big factor in choosing an inflatable hot tub and Coleman has come a long way in this department. The tub features puncture resistant TriTech material and two layers of PVC for extra strength and durability. Add to this, a sturdy vertical construction that allows users to sit on the edges without the hot tub bending or buckling. The LifeSmart Rock Solid Simplicity Plug and Play Hot Tub is absolutely amazing. It combines the benefits of a portable hot tub with the benefits of hard shelled hot tubs in one complete unit. It is ideal for indoor and outdoor use because of it's a Eco Smart technology that's highly energy-efficient. It meets the California Energy Mandate for spas and hot tubs and is ideal for cold winters, in a portable design. The LifeSmart plug and play can comfortably seat 4 adults in the moulded shell design that features textured rock colouring. The material is extremely durable with the addition of a child-safe locking thermal cover. It will require less energy and deliver better performance with its full-foam insulation system and energy-saving spa cover. You can count on saving money every year with this energy efficient hot tub. A portable hot tub good for winter conditions and freezing temperatures is a bit of a challenge. It can get really expensive to keep an inflatable hot tub heated during the winter even if the thermostat stays above freezing. Most portable hot tubs just aren't designed to be operated efficiently in temperatures below 50℉ (10℃) because they don't have adequate insulation. You can end up spending over $100 a month to keep an improperly insulated hot tub heated during the winter. If you plan on using a portable hot tub in cold weather, when the temperature dips down to 30℉ (-1℃) you can end up with freezing and damage to the plumbing and hardware. The lack of insulation make it incredibly tough and expensive to keep the water heated all winter for the average inflatable hot tub. If you are planning on using your hot tub outside in winter temperatures between 32℉ (0℃) and 50℉ (10℃) and want the benefits of a portable unit, we recommend the LifeSmart Plug and Play featured above. It has enough insulation to keep electrical usage at a reasonable rate and should resist freezing if the water stays heated all winter. Always follow the manufacturers's instructions for operation in cold temperatures. A portable hot tub for winter in Canada needs to be capable of withstanding temperatures as low as -25℃. There just aren't any inflatable tubs that are even worth considering unless you live in a mild climate like Vancouver. If you live in a mild winter climate you should stick to a highly insulated unit like the LifeSmart just to keep your electrical usage within reason. The following portable hot tub hacks will help you save money, prolong the life of your tub and increase your enjoyment, and who doesn't want that! We've put to gather a list based on customer reviews, trial and error and making mistakes ourselves. Always use a cover. It'll save you money by retaining heat, preventing evaporation and keeping it clean. If your hot tub doesn't have insulation, make your own by being creative. This can be done inside the cabinet, around plumbing, etc. Place your hot tub in a place that gets sun during the day for free heat. If you're handy, try using a gas or propane heater designed for heating water. Only try this if you are experienced in working with electricity. If it says suitable for 6 people, it probably fits 4 comfortably. If it says 4, you'll fit 2 comfortably. It's just like camping tents..
Lower the thermostat when you're not using the hot tub. Set up a wind block. Wind is the enemy when it comes to hot tubs, it will cost you a fortune to keep your hot tub heated if it's windy and you're not using a quality cover. Use a solar bubble cover under the locking cover. They are cheap and can be cut to fit any size. We hope you've enjoyed reading out portable hot tub guide and wish you many relaxing and joyful years of hot tub soaking.